February comes to an end and March is ready to present itself. Spring is round the corner and the nights are getting lighter. I usually start contemplating what the springtime has to offer sometime in March; however, if you think about it, we really should be thinking about it now. Before we move onto a new season, a new phase in our lives, a new space, we need time to reflect and appreciate what we have achieved in the current season; how far we have come and where we have come from. Then, you can make a choice to close that chapter of your life, and move on. Whatever your religious beliefs are, I hope the prose above resonates with you. I really do believe that there is a time and season for all things and sometimes, we find it hard to let go and move on. And, that could be a job, a house, relationships … We hang on because we fear the unknown. Who knows what the future holds for us and so we hold on to what and who we know. It is comfortable. It feels secure and safe. Yet, if we were honest enough with ourselves, we know …. deep down … that it is time to move on. Along my journey through life so far, I have given up a secure job as a senior university lecturer to become self-employed. Since moving to the UK, I have moved homes seventeen times in 29 years. I have been single, engaged, married, divorced. Friends have come and go. Loved ones have passed away. 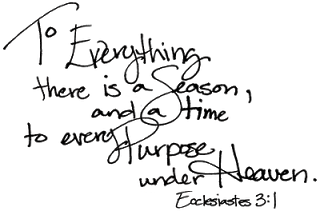 Yes, to every thing there is a season. None of them have been easy. Lots of tears were shed at various points along the journey, and yet when I look back now, it was OK. I am OK. Life happens and life moves on, and we move along with it. Friends that were a crucial part of your life because they were a shoulder to cry on when times were tough, are no longer a regular feature in your life, but, you do still think of them and you “keep in touch” on Facebook. The little one-room flat you called once called home and loved dearly, is a fond memory. The job you got out of bed for every morning that brought in a steady salary, is something you cannot imagine ever having done now. And, … it is OK. It will be OK. The memories will be there. It is all part of the journey, so if you are feeling scared of letting go, just look back and see how far you have come. The practice of yoga is about self-reflection. Know that whatever decision you are facing, whatever you need to let go of, is but a blip in time and space. No one knows what the future holds, so what you can to prepare and create your future. This can be challenging and requires discipline.